Andy Padilla (left) and Naomi Perez (right) argue before judges in the final round of the Regional Competition. Both will compete in Washington, D.C. this spring. Teenagers from across Albuquerque competed against one another in the annual Marshall-Brennan High School Regional Moot Court Competition at the UNM School of Law. They presented oral arguments before members of the New Mexico legal community who volunteered their time to serve as judges. 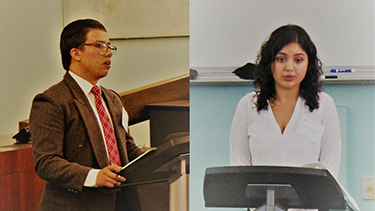 After four grueling rounds of fact recitation, court case citation, and judge interrogation, four finalists were selected to represent New Mexico at the National Marshall-Brennan Moot Court Competition in Washington, D.C. this spring. The Regional Competition is a major component of the overarching Marshall-Brennan Constitutional Literacy Project. The Project features law students in their second and third years who serve as teaching fellows by providing instruction to students in the areas of Constitutional Rights and Criminal Procedure. This semester alone, the fellows taught weekly courses at the Digital Arts and Technology Academy, Highland High School, Mark Armijo Academy, South Valley Academy, and West Mesa High School. The Project is one of the many ways that the UNM School of Law connects with and serves the people of New Mexico as part of its Child and Family Justice Initiative (“CFJ Initiative”). The CFJ Initiative arose from a grant that the W.K. Kellogg Foundation awarded to the Law School two years ago. One the goals of the CFJ Initiative is to create a pipeline of students who reflect New Mexico’s diversity and are committed to serving the legal needs of New Mexico’s most vulnerable children and families. In addition to the Marshall-Brennan Project, and the W.K. Kellogg grant-funded work, a number of other similarly exciting efforts exist at the Law School that allow it to be a partner in better serving New Mexico’s many diverse communities, such as the Wild Friends Program, the Child and Family Justice Clinic, and the Medical Legal Alliance. If you would like to support the Marshall-Brennan Project or learn more about the Child and Family Justice Initiative, you can do so by contacting Sal Guardiola II at 505-277-9065 or guardiola@law.unm.edu.